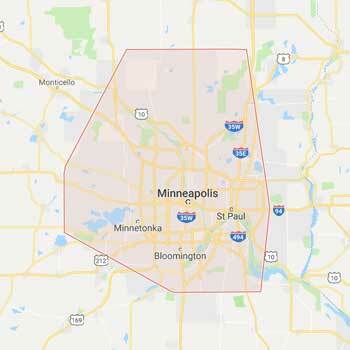 We provide emergency and same day hot water heater replacement for the entire Minneapolis and St Paul Twin Cities metro area with fast repairs, friendly customer service, and expert technicians. We carry all the top water heater brands and are ready to serve you the same day. We will install the new heater, remove the old unit, and clean up our mess before we are done. Your satisfaction is guaranteed! 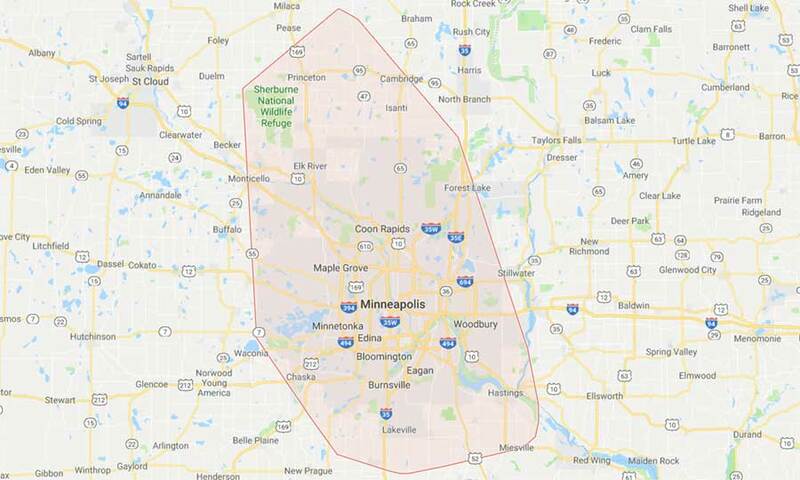 Our fleet of mobile service technicians replaces more than 3,000 hot water heaters each year. 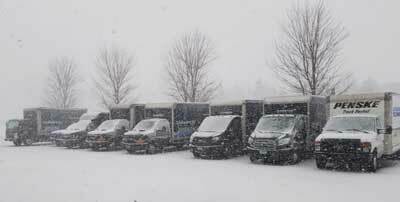 We are ready and equipped to handle your needs ASAP! 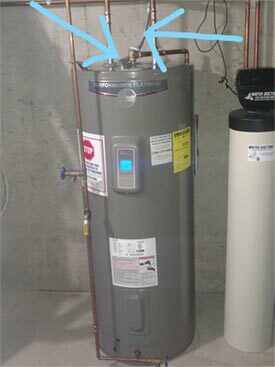 To give you the FASTEST service possible, we’ll need to know a few things about your water heater and your home. The first step is to identify what type of heater you have now. We’ve put together these photos and explanations below, to help you out! 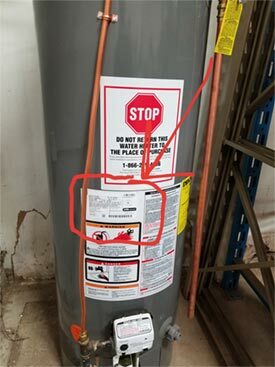 Look for the sticker that looks like this on your water heater. Here you will find the model number. Write this down, or take a photo of the sticker for reference. 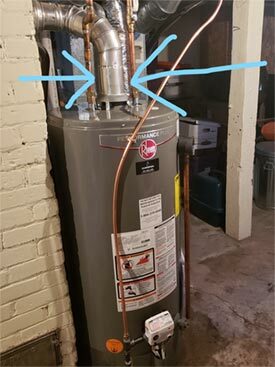 If you have an electric water heater, you will find a metal conduit with wires inside of it that attach to the top or to the side of your water heater. 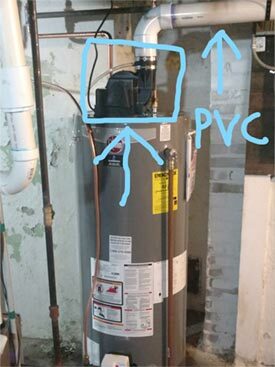 If you have a power vent water heater, you’ll find a motor on top that plugs in. It will have a white PVC or black ABS plastic pipe that extends to the outside of your home. Metal venting on top means it is a gravity vent, or atmospheric water heater. These can lead to a brick chimney (as pictured) or B-vent liner through your rooftop. 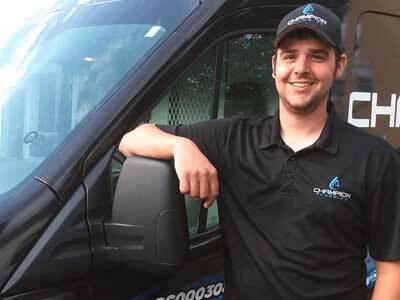 ★★★★★ Conor from Champion Plumbing came on time as promised to install my water heater. He is very knowledgeable and professional at his work. He knows the building codes and recommended the heater models to meet my needs. The install went smoothly and he cleanup the area after he is done. I am very satisfied with his work and Champion Plumbing. Thanks! ★★★★★ Darnell from Champion Plumbing arrived early, was quick, clean and courteous and most impressively, he took the time to explain what he was doing to my 4yr old and showed her interesting things from his truck. For a plumber to set an impression w/ a 4yr old girl, that’s saying something. I’d recommend Champion Plumbing and I will be using them again in the future. ★★★★★ Lee was very professional and courteous and answered all my questions/concerns clearly before beginning. He installed a new water heater for me and had it done very quickly. From beginning to end this was a smooth process, no hidden fees or hassles. Thank you! ★★★★★ I love writing well-deserved reviews for fantastic service. That’s the case with Champion Plumbing and the great plumber, Lee, who installed our new water heater this morning. Lee was on time, personable and professional! He installed the new unit and hauled away the broken one. Additionally their price was considerably less than the competition. I’ll hire Lee and Champion again! ★★★★★ Kyle was amazing! He installed my hot water heater in a short amount of time and thoroughly explained everything to me. I will definitely use Champion Plumbing again!